This category is for the discussion of sign vinyl and car wraps. We will discuss the FDC brand of sign vinyl and tips and tricks for application. Send it to your cutter. Weed while the machine cuts the next design. But what if we take a minute and think outside the box (or in this case the shirt)? The possibilities extend beyond the normal wearable fabrics and into our home or office. 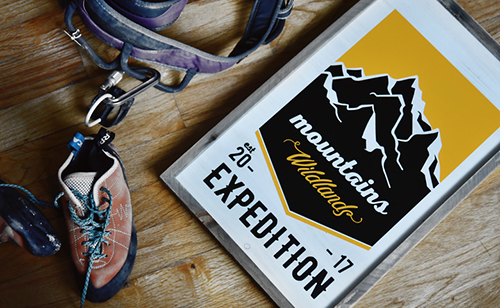 Make sure to test your HTV on each surface before applying your entire design, and purchase extra vinyl and product blanks. *Do not wash in the dishwasher. 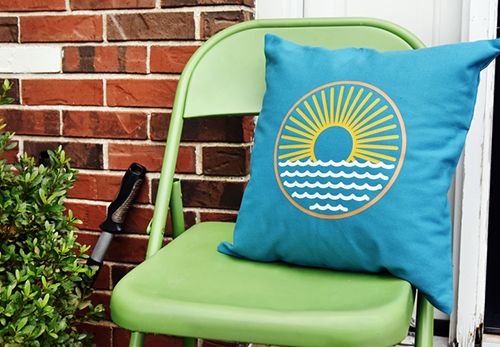 Enhance any room with throw pillows showing your favorite quote, monogram, or graphic. 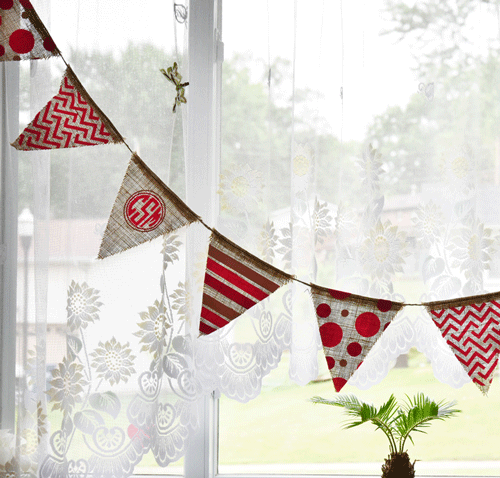 Decorate for birthday parties or dorm rooms with customized burlap banners. Create custom cork coasters to brighten up any conference room. We all love HTV because of its wide selection of colors, textures, and patterns, but let’s not forget about the endless possibilities with sign vinyl! 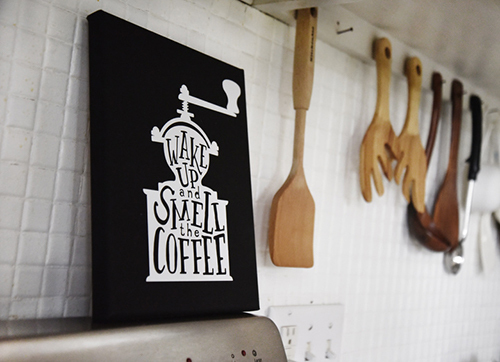 Create custom signs with affordable craft store finds! 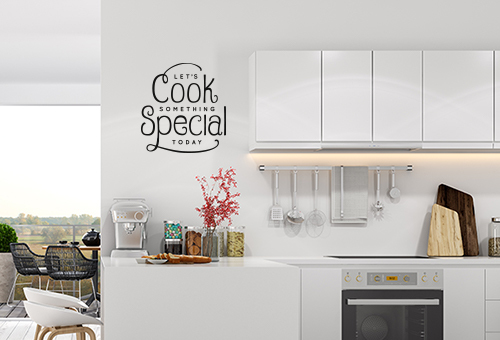 Display your favorite quotes in any room with removable wall vinyl. Have more ideas? Show us your creations in the comments below and shop our wide selection of vinyl now! As soon as we heard about our new FDC 4301 series removable vinyl, we couldn’t wait to try it out! Wall vinyl can be applied to any flat surface and removed much easier than normal sign vinyl. It’s our preferred way to decorate interior spaces, phone cases, notebooks, etc. with original designs or pre-made vectors found online, and some wall vinyl. 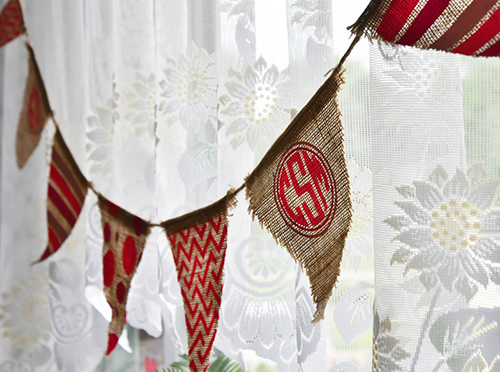 It’s perfect for creating profitable decals for any room! 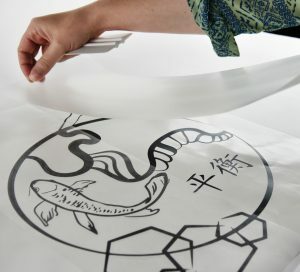 All you need is a roll of vinyl (offered in black or white), a masking tape and a vinyl cutter. For our project, we used a Graphtec CE 6000 vinyl cutter and medium tack masking tape. Unique, original designs are best, but something as simple as text or a quote can be just as effective! Just make sure that your lines are solid. This is typically a project for single color designs using either black or white. 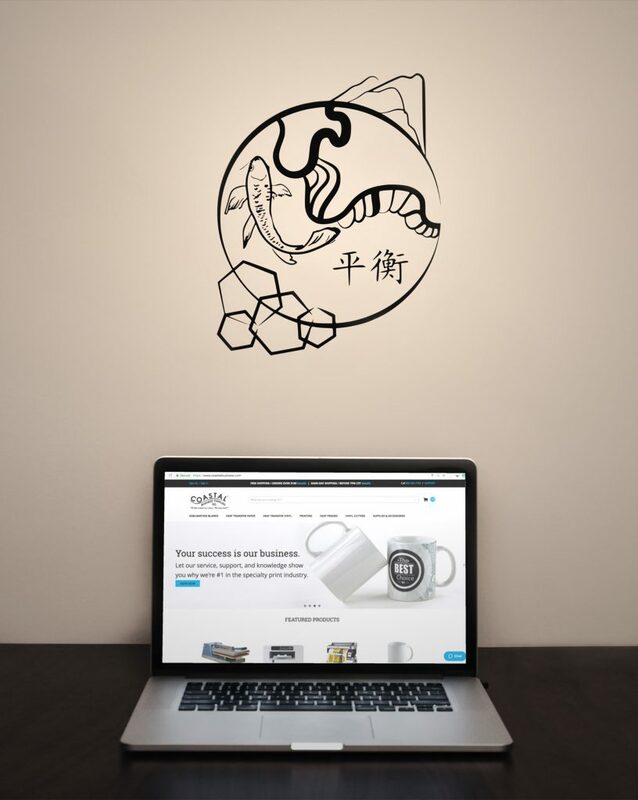 Since we are placing our design on a light-colored wall, we are going with black vinyl. There are a ton of programs to design in, but our favorite is Adobe Illustrator. 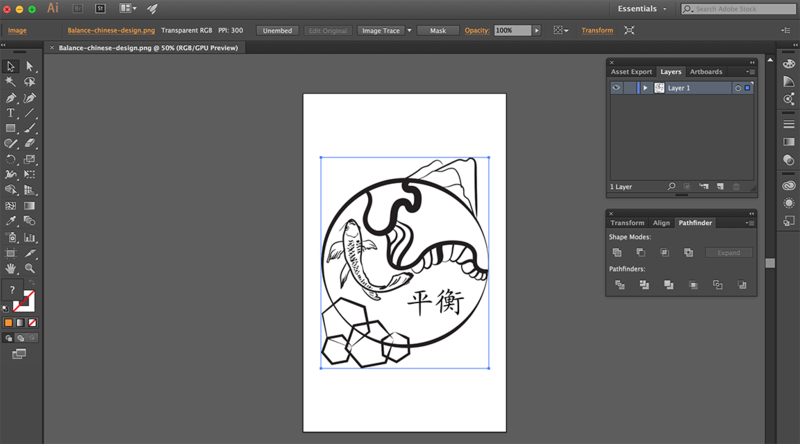 You can send your design from Illustrator to Graphtec’s Cutting Master plug-in by going to File –> Cutting Master –> Send to Cutting Master. (Learn more about this process here.) 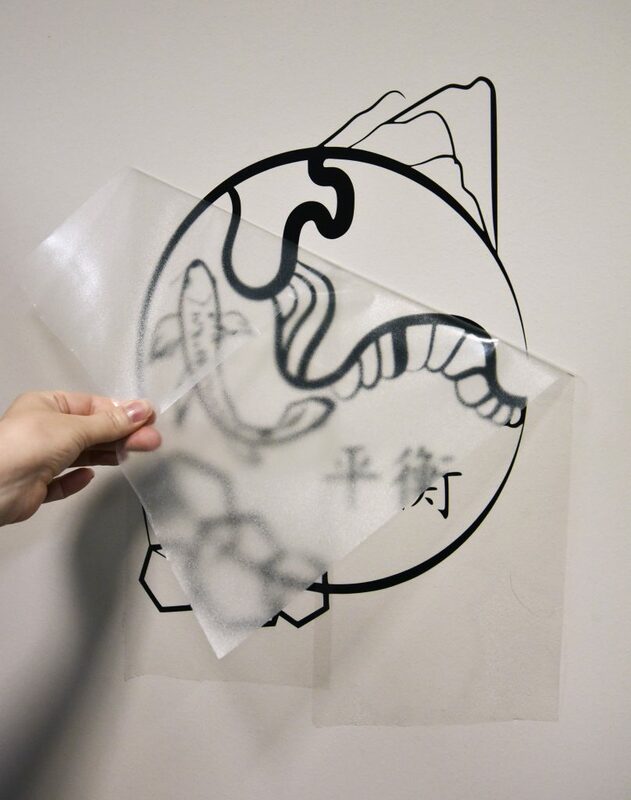 From there, simply send your design to the vinyl cutter. Do not mirror the design! Always do a test cut and adjust accordingly! Just like any other vinyl, the next step is to weed away the excess background vinyl. We use our favorite rubber grip weeding tool to help with the process. During the weeding process, the vinyl can easily stick to other pieces and pull up smaller details. 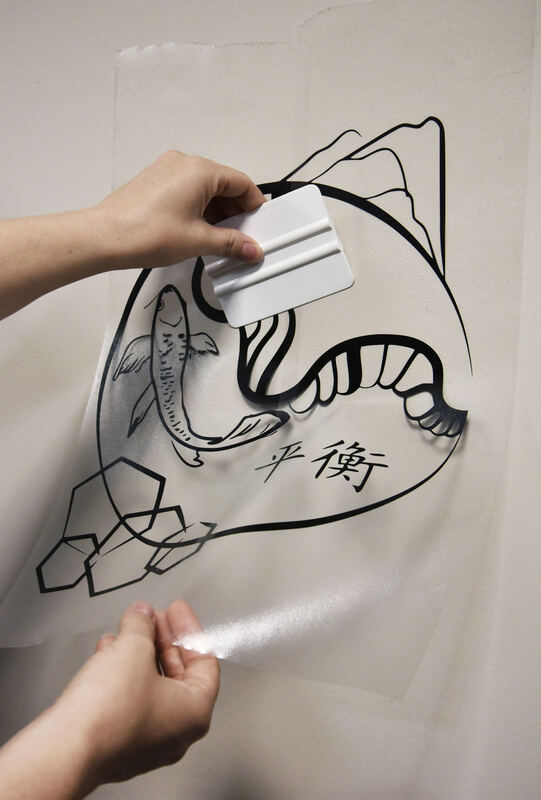 Wall vinyl has a very sticky adhesive as you peel it so be careful! Once all excess vinyl is removed, place masking tape on top and rub with a squeegee or your fingers to remove air bubbles. The manufacturer, FDC, recommends the low tack mask made for removable wall vinyl. We use the medium tack mask, which also works great and is transparent! Apply pressure when rubbing the top of the design to ensure all details are picked up by the tape. Place on desired surface or wall! The last step is simple! Peel the masking tape together with the design. Do that in smooth and slow motions, making sure small details are on the tape. 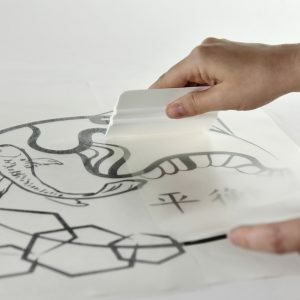 From there, place the design on a clean flat surface. We found a great spot here in our office above a desk! The space looks and feels instantly more zen. Order a roll of FDC 4301 wall vinyl today and share your creations with us on Instagram by tagging us (@coastalbusinesssupplies) and use #InspireMeCoastal! 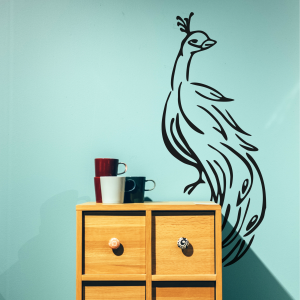 We’re excited to announce our latest line of wall vinyl now available in our online store: FDC 4301 Series Removable Vinyl in Satin and Matte finishes. This calendered vinyl is 3.0 mil thick and perfect for creating wall graphics, medium-term signs, and decals. It removes cleanly without any adhesive residue and offers one year of outdoor durability. Currently we offer two colors: black and white. We recommend cutting the FDC 4301 Series with our line of Graphtec cutters, the CE6000 models or FC8600 models) for the highest precision and speed. 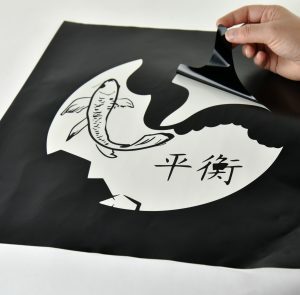 For hobbyists or vinyl beginner, use the latest model of Silhouette Cameo as it offers a better grip on the vinyl than older Silhouette models. Helpful Tip: When cutting sign vinyl, cut with the colored side up. There is no need to mirror or flip the image! Always perform a cut test if possible to determine the best blade depth. You can start with standard vinyl settings and adjust accordingly. We also suggest using the FDC 2602 Series paper application tape to apply the vinyl to your choice of material. If you desire a higher tack tape, the 2612 Series medium tack R-Tape is also compatible with this vinyl. Order a roll of wall vinyl today and share your creations with us on Instagram by tagging us (@coastalbusinesssupplies) and use #InspireMeCoastal! We may share your designs on our page. We can’t wait to see the results!